Enhanced software including cyber security, call center artificial intelligence and cloud applications. Eligible costs include employee wages, cost of supplies, cost of testing, contract research expenses, and costs associated with developing a patent. On January 2, 2013 President Obama signed the bill extending the R&D Tax Credit for the 2012 and 2013 tax years. The U.S. utility network is practically the eighth wonder of the world. The $876 billion asset includes almost 7,000 power plants, 450,000 miles of high-voltage transmission lines and 3,300 different utility companies which serve over 150 million customers –astonishingly referred to as “ratepayers”. Much of the grid was built just after WWII and has not been updated since the 1970’s. The basic design system was invented by Thomas Edison over 130 years ago; and about half of the homes on the grid still use mechanical meters that require a utility worker to take a reading. These meters provide customers with no details about their energy consumption other than a monthly bill. The chart below demonstrates the increasing frequency of blackouts as the grid ages. 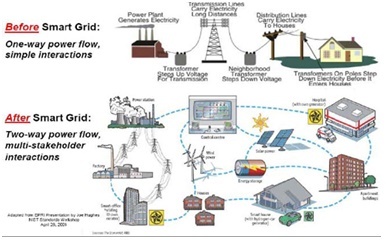 The main problem with the current grid is that it is highly inefficient. Substantial energy is wasted because the system doesn’t know exactly how much energy will be needed at any given time. It currently relies on guesswork which often results in overproduction and wasted electricity. The American Society of Civil Engineers described the nation’s electrical grid as a patchwork system that will ultimately break down unless $673 billion is invested by 2020. It is estimated that over the next 10 years more than $30 billion will need to be invested in New York’s electric system alone to replace aging infrastructure and maintain generation resources just to meet currently projected energy demand. However, the need for this investment could be substantially reduced through innovative and less costly alternatives. The Rosenfeld thesis challenges the conventional belief that energy demand and GNP work in tandem. With the conventional belief, the consensus logic dictated the continuing need to build more power plants. However, a group of leading physicists led by Princeton University physics professor, Art Rosenfeld, wouldn’t accept the conventional wisdom. Rosenfeld and his colleagues proceeded to put together an influential Princeton energy study which concluded that systematic steps to improve energy efficiency could materially reduce demand. These cost saving alternatives are crucial to the utility industries survival as competing energy sources begin to emerge. Traditionally, the utility industry had no meaningful outside competition forcing change. More recently, other sources of power such as rooftop solar are becoming increasingly practical and affordable, putting pressure on utility companies to provide more cost efficient alternatives. The government is compounding this pressure as well with its recent Supreme Court decision requiring greenhouse gas controls on power plants which emit above a certain threshold of conventional pollutants. The ruling is a major concern for specific utility companies, particularly coal burning plants, who have been largely effected by the decision since their facilities are generally the highest emitters. Prior to 2007 the EPA did not have conclusive authority to regulate greenhouse gas emissions. Up to this point the EPA only regulated those emissions which caused a serious danger to the public health. Carbon Dioxide was of lesser concern. However, in Massachusetts v. Environmental Protection Agency the court ruled that carbon dioxide emitted from motor vehicles is an “air pollutant” causing “air pollution” and can therefore be regulated under the Clean Air Act. More recently, the power to regulate greenhouse gases was expanded to include regulation of emissions from large power plants and coal burning facilities in Utility Air Regulatory Group v. EPA. The decision was largely a victory for the EPA as the court ruled that the EPA may issue “performance standards” limiting carbon pollution from large stationary sources such as electric power plants. On the other hand smaller emitters received a marginal victory on the issue of whether or not the power to regulate carbon emissions from motor vehicles extends to all stationary sources. The court ruled that it did not because such a ruling would “unreasonably place excessive demands on limited government resources” iii as small buildings such as schools and libraries would then be subject to costly regulations. Overall the decision served as a another source of pressure forcing change on the utility industry because while the EPA may not limit carbon-dioxide emissions from small stationary sources, it may now require “best available control technology” (BACT) limiting carbon-dioxide on end-of-stack controls of larger sources which emit over a certain threshold of conventional pollutants. Justice Scalia, the author of the lead opinion said from the bench that the “EPA is getting almost everything it wanted in this case.” The EPA now has authority to cut back on such pollution at eighty-three percent of the sources across the country, which is only three percent less than they originally sought. The ruling however serves as only one of many sources of pressure on the utility industry to keep up with the rest of the economy in terms of innovation. In addition to increased solar capacity discussed in the Barclay’s note, energy efficient LED lighting is also markedly reducing overall electricity demand. Accordingly, the U.S. utility industry is beginning to confront challenges related to continuous revenue decline. One important aspect of the “smart grid” is that it gives consumers the tools and information they need in order to make better decisions about energy use. For example, customers who have energy storage capabilities will be able to harness and store energy at night when the price of electricity is cheaper. Moreover, the customer would not have to wait for their monthly statement in order to gauge how much energy they have used in order to adjust. “Smart meters” and other mechanisms, will allow customers to see how much electricity they have used along with its cost on a real time basis. With the help of digital sensors and intelligent communication networks, utility companies can receive information about how an asset is being used and allocated, what the condition of the asset is, and how to best utilize resources to manage electrical costs. Using a combination of location, intelligence, and real-time network monitoring it is possible for companies to reduce asset maintenance costs, improve network reliability, and lower asset replacement costs. The utility industry is poised to make tremendous investments in enhanced software. Software is the fastest growing R&D category in the United States and many external and internal integration costs related to software are potentially tax credit eligible. Perhaps the cornerstone of the new smart-grid is in its ability to give customers and systems operators information about energy consumption, storage, distribution, and other situations which facilitate planning. Some smart devices even do the planning for you. The Honeywell Lyric thermostat knows when you’re not home and when you’re approaching your home by tracking your location via smart phone. The app draws a perimeter around the house and turns up the heat or electricity when you enter the zone. When you leave it turns it down. Customers are becoming increasingly comfortable using these types of devices as well. For example the chart below shows the rise of smart meter installations in the U.S.
Conscientious utility consumers prefer to have access to updated information from their providers at all hours of the day and night. However, online information, frequently asked questions and site searches aren’t always capable of providing specific additional answers to the narrow questions customers often ask. These inquiries are often customer specific involving questions related to billing, electronic payments, service outages, installation times, repair service scheduling, utility rebates and an assortment of other issues. To handle the constantly-increasing demand for service, companies can hire more staff, but there is a more cost-efficient and potentially higher quality solution with artificial intelligence. Big data combined with artificial intelligence and natural language processing allows computers to answer repetitive questions so that human service workers can focus on building customer relationships by providing a personalized service in other areas. Technology platforms are constantly evolving to improve the accuracy and efficiency of this process. For example, when a question has been answered successfully by the computer, the automation system can store the conversation and compare it to a subsequent question in order to generate another successful response. With machine self-learning capabilities these conversations can then be sorted by the computer to gain insight into which issues are most prevalent. This can help pinpoint trends and opportunities that utility companies might not otherwise realize. Other large utilities in the U.S. are threatened by cyber-attacks as well. The utilities, subsidiaries of ITC Holdings Corp., Duke Energy Corp. and NRG Energy Inc. each filed a report with the U.S. Department of Energy in the past year detailing suspected cyber-attacks. The reports highlight the interest by hackers in targeting energy firms, and the vulnerabilities of IT systems used to run power generation and distribution equipment. Because of these threats, utility companies must continuously evolve their cyber security programs. At Carnegie Mellon Institute researchers are addressing cyber-security challenges of the smart grid by applying their experience in secure coding, resilience management, secure systems and other areas. The plan is to develop actionable security guidance for smart grid applications in the form of security profiles. This work is part of the Advanced Security Acceleration Project for Smart Grid (ASAP-SG), a public private collaboration. Smart meters, artificial intelligence, cyber security systems and other software are substantially increasing data. Recognizing the value and capabilities of cloud storage our Federal government is exiting the physical data storage business and utilizing the cloud. Presumably electric utilities will also exit the data storage business and look to constantly improving cloud applications. The fact that the CIA is now utilizing Amazon’s secure cloud should provide assurance to any utility companies’ security concerns. The draft 2014 New York State Energy Plan sets forth a vision for New York’s energy future which integrates more renewable power sources—hydro, solar, wind, and other carbon-free solutions. The NY plan may serve as a national indicator. The objective is to provide clean, reliable, and affordable power while creating jobs; and producing other economic and environmental benefits that flow from a clean energy economy. Con Edison has moved ahead of the plan by asking residents in Brooklyn and Queens to power down in order to avoid a $1 billion investment in a substation and related infrastructure that would be needed to meet the expected electrical demand in 2019. The electrical demand is expected to occur as a result of the growing NY population. The company’s plan to invest in programs to reduce electricity consumption and defer construction on the substation would only cost $100 - $150 million vs. the billion dollar investment in the substation. Customers will benefit from incentives that compensate for activities which contribute to grid efficiency. Appliances in the home will autonomously monitor energy prices and shift into sleep mode during peak hours in order to save money. Homes will be equipped with solar panel systems which will enable customers to sell unused energy to their neighbors. This is all part of the plan to make the grid more cost efficient, reliable and flexible. In the new utility industry, environment utilities must innovate. However, they cannot ask their customers to shoulder the required R&D investment costs without abandoning the high costs of unnecessary, legacy power plant assets. Simply stated, low capacity power plants need to be cannibalized or removed from the system to help pay for the modern grid. Public service commissions and utility management must jointly agree to and implement these types of new dynamic strategies. The first innovation process should be to produce a realistic dynamic model that forecasts prospective electrical demand. This revenue forecast should reflect economic projections and the projected impact of energy efficiency such as increased LED lighting installations and alternative energy including solar and wind. For this element the utility needs to calculate the projected operating capacity of each power plant asset consistently with the demand/ revenue forecast. The cost elements of the model should be conservative and include all mandatory power plant emission reduction investments, smart grid investments including enhanced battery storage, and cyber security investments. With the integrated model the utility should compare the required investment at each plant with its projected operating capacity. Low capacity plants that require high investments should be carefully analyzed for potential planned shutdown. Here the utility should look at the required investment to accelerate energy efficiency and alternative energy generation to accelerate the closing of uneconomic facilities. LED lighting is a very cost effective way to quickly reduce aggregate electricity demand. Once the modeling process is complete and the remaining power plant assets are identified the utility will know which assets to focus on for further R&D investments. The U.S. utility industry is confronting unprecedented challenges. Marked reductions in demand will increase pressure to innovate. Research and development will unlock the doors to innovative solutions in smart grids, enhanced software, efficient call centers, cyber security and cloud computing. Still, utility companies cannot expect customers to shoulder the costs of this innovation. To make room for new technology utilities must abandon outdated power plants and expensive assets. Federal and State tax credits are available to shoulder the costs of some of the new solutions.